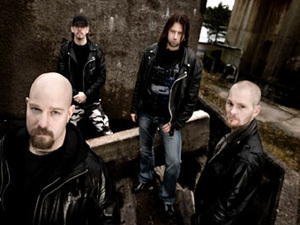 In Spring 2010 The Vision Bleak will release its fourth studio album ‘Set Sail To Mystery’ through first class label Prophecy Productions. Save your power at New Years Eve celebrations, because we have a better option! On January 2nd, 2010, from 06:30 - 09:00 pm, there will be an official pre-listening of The Vision Bleak's fourth album "Set Sail To Mystery" in Berlin's Access Bar (Greifswalder Str. 33, 10405 Berlin, Germany). The musicians will be present for this event to answer the questions of their fans. On top of it, every fan will get a small, exclusive TVB gimmick for free. Herewith I sincerely wanna invite you to this event. As the Access Bar has limited capacities, we ask you to arrive on time. Admittance only as long as there is enough room! 'Under A New Sun' has been named as the title for the up-coming album from The Eternal set to see the light of day in 2010. The album will be the follow up to the acclaimed 'Kartika' & also the bands fourth full length album. We can also reveal that song titles include: 'Control', 'Under A New Sun', 'A Thousand Shades of You', 'Collapse' & 'Cast In Stone' to name a few. The band enter 301 Studios in Byron Bay on December 4th. The blog will be updated daily throughout December with pictures and the latest news on the recording process, so be sure to check it out. The album will be co-engineered by Paul Pilsneniks who has worked with such artists as The Living End, The Mars Volta, Silverchair, Grinspoon & Alanis Morissette, and The Eternal has also enlisted acclaimed Finnish keyboard player Maria Ilmoniemi (Tarja / Husky Rescue) to contribute. 15th anniversary celebration needs big names. On January 25th, 2010 the time of wait is finally over! Israel's ORPHANED LAND will finally release their highly anticipated fourth studio opus "The Never Ending Way Of ORwarriOR" in Europe. Mixed by Steven Wilson (Porcupine Tree, Opeth), who is also responsible for several keyboard parts on the new album, "The Never Ending Way Of ORwarriOR" turns out to be a sophisticated concept album taking ORPHANED LAND's unique brand of exotic, heavy music to soaring new heights in terms of complexity and catchiness. It is an audible manifest that the time has come for Middle Eastern metal to take over! ridiculously have been killing each other for centuries "in the name of God" and turned the holy land into an orphaned land.Naturally we continued this idea of union on a musical level as well and the result is as always crazy, it's a miracle - in our concerts: our Jewish fans sing in Arabic and our Muslim fans sing in Hebrew, brave friendships have spawned and our Middle Eastern metal music destroys all this political witchcraft we have been trapped in for so long. This is a musical journey of hope in lands of war, creating heaven on earth, building a new Jerusalem." some of them even proudly bearing ORPHANED LAND tattoos, even though that puts them at huge risk in their home countries! The African musician Fela Kuti once said: "music is the weapon of the future"
- ORPHANED LAND is the living proof of that! "From then on, there are going to be a lot of changes in the Satyricon camp, after we take a long touring break and come back a couple of years later, certain people may not be with us any longer. Although we won't be doing anything overly dramatic, we'll be trying quite a few different things, which I think is going to be really good for Satyricon. The reason we're doing that is so we can continue to develop our sound. At the moment we are still enjoying what we do, but if that continues any longer it'll undoubtedly stagnate, so we need to ensure that doesn't happen. And moving in different musical directions is definitely a good way to go about it." "As an artist, there are so many new things I'd like to do, and one of them is to work on some songwriting for Satyricon, though from an entirely different angle. For example, we may chose to go for a similar tone, but use a different set of instruments in the next record. Maybe there are also other recording techniques, which could add a different element to our work and open up fresh musical territory. Our last three releases all follow a certain style and pattern, and we want to create a record that's radically different from the others. Though the foundation of Satyricon's sound — my songwriting and Frost's signature drumming — will always remain unchanged." Set for a February 15th release, ROTTING CHRIST's upcoming album is entitled "AEALO", correlatively with the band's will to delve deeper than ever before into their Greek roots. Frontman Sakis explains: "AEALO is the transcription of the ancient Greek word ΕΑΛΩ into the Latin alphabet. It means thrashing, catastrophe or destruction and reflects the musical and lyrical content of the album. The concept of 'AEALO' deals with the feelings of a warrior during a battle, therefore the album's title bears this sense of anger, fear and grief." You will also be pleased to know the Greek metallers invited some famous guests to be featured on the album, namely Greek-American vocalist Diamanda Galas and PRIMORDIAL frontman Alan A. Nemtheanga! "It sounds classic Rotting Christ although it sees them continue where they left off with 'Theogonia', further away from the older 'satanic' feel and more into the realm of the ancient Greek gods, mythology and folklore. I think and feel it is this influence that has in many ways unchained the band, giving them more freedom to explore their own heritage and culture. It invokes the proud spirit of history, just as Primordial tries to do! In this respect we are like brothers!" ROTTING CHRIST main man Sakis made the following comment on Alan's participation: "Collaborating with Alan from Primordial on a song from the new album was an honour for our band. By including his great voice in our album, we believe he brought the mood we were seeking for this specific song: a Celtic mood that has so many similarities with the ancient Greek culture and atmosphere that this album exhales. Alan definitely lifted up the specific song because his voice is great and, most importantly, unique. We are honoured to work with the voice of Ireland!" As for Diamanda Galas' feature, the song she appears on is a cover of "Orders from the Dead", from the lady's "Defixiones, Will and Testament" album, to which Sakis wrote new music. "It is a huge honour for our band to have Mrs Diamanda Galas on our new album", Sakis states. "Getting her approval to use her voice as it can be originally heard in her "Orders from the Dead" song feels like we did the most successful cover in our career, with one of the most soulful songs in the history of music. The dead are still waiting for their justification..."
(add any big Finnish Metal band for namedropping) at Finnvox Studios. The album cover artwork was done again by the band's own guitarist Skrymer. album we have created so far." 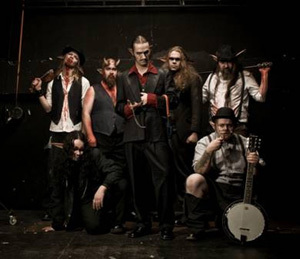 Whereas the band's unique style has spawned an entire new genre that successfully blends black metal darkness with folkloristic melodies, in 2010 FINNTROLL shall proudly reclaim the folk metal throne and leave myriads of copycats crushed to pieces. exact Benelux dates and be there! WARFECT is without any doubt the new big thing coming from Sweden. WARFECT is an explosive mixture of hell bent riffing inspired by giants from back in the day with the addition of a ravishing new trademark sound. The debut "Depicting the Macabre" is a collection of blazing solos in harmony with fast paced rhythm sections accompanied by crushing drum hammering and melodic choruses. A must have for those into bands of the early days of thrash metal like Sepultura, Paradise Lost, Slayer and Metallica. The appointment for the definitive releases is November 16th, 2009.